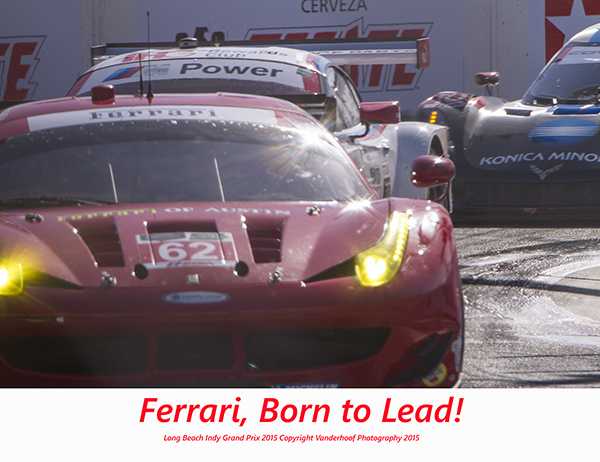 Ferrari, Born to Lead! 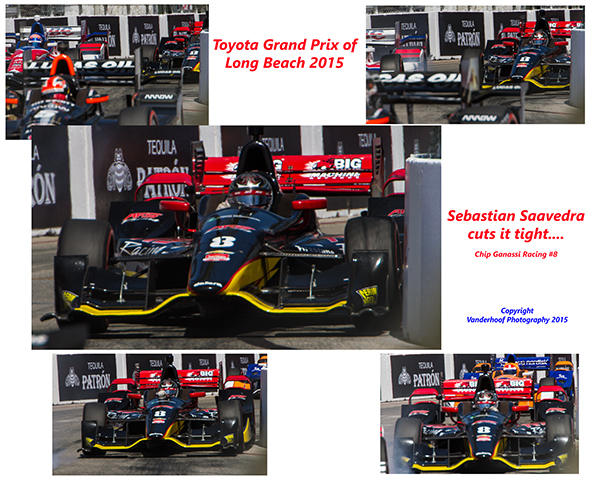 and other 2015 Long Beach Indy Grand Prix photos for sale and just look at!!!! 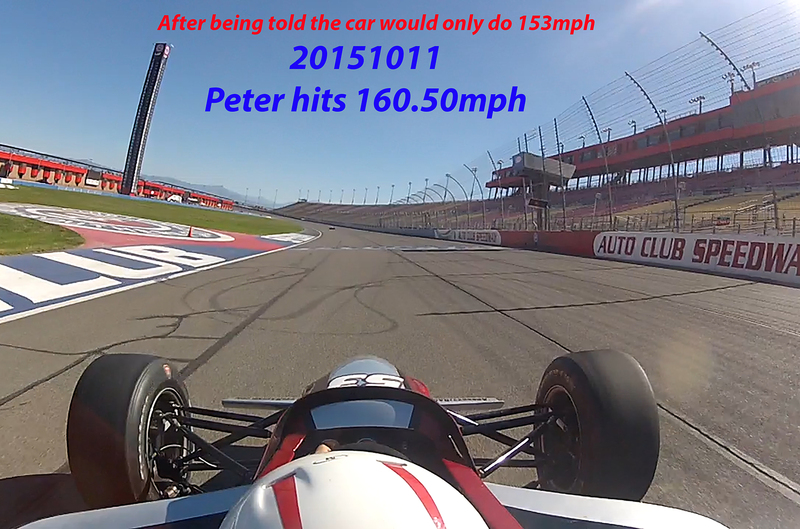 Chip Ganassi Racing driver Sebastion Saavedra making a tight chicane turn. 5 shot series on 16 x 20 semi gloss archival Baryta paper. Photographer printed, signed and dated. $65. (usa dollars) Plus shipping. Matted or framed charged extra. Screen shot of Sebastian Saavedra Facebook page, shows he got see the photo series and much to my delight has accepted a free print. Been chasing the night skies since the 1970’s……..
A bit older, but still feeling like a kid……digital media age is just starting! The tools and creative fun of my past coupled with the new digital cameras and digital process to make prints. A good photograph or any work of art should be taken in slowly, enjoyed like a mellow cup of fine coffee (or tea), and savor the flavors of the moment that was captured by the vision of the photographer/artist. Which brings us to my story of the Thermos Brand Stainless Steel French Press and camping out. Now, I know that lots of people when they go backpacking, they just take instant coffee and that is that. Me, I have never liked the powder taste. In a pinch I’ll drink it, but camp coffee, a No. 10 tin can, cup of grounds and water is better. I drink Expresso, Turkish, Armenian, to name a few, so, nope the grounds don’t bother me that much. But a nice cup, free of grounds for the most part is better still. When most people celebrate a victory, they use champagne. Me, It’s a Fine cup of Coffee! 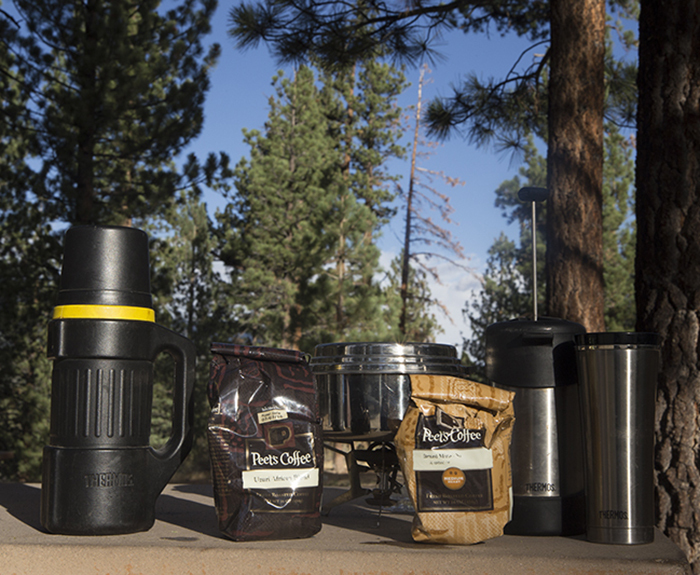 I have been going camping over the past few years and it is a bit of an issue to have a decent cup of my Peet’s Coffee. I’m getting older, so yep, I want to relax once in a while on photo sites. When you get up before the sun and come back a few hours later for breakfast, you want to relax and enjoy the cup of coffee with your surrounding. My photographer buddy Clive, car camps and backpacks with me and we are planning some longer backpacks into the Yosemite and Kings Canyon area. We are both active Angeles Chapter Sierra Club Camera Committee members, going on outings and meetings regularly. Peet’s Coffee, as the story was told to me in 1983, is the company that roasted and sold coffee in Berkeley California, who had a few employees leave and become STARBUCKS! Peet’s Coffee is about the coffee bean, and Starbucks is More about all that sugar and flavors, in my opinion. Bean to Bean, I take Peet’s! I do drink at Starbucks from time to time. Me, I’ll take a nice coffee, hot or iced, just the beans, no added flavor. 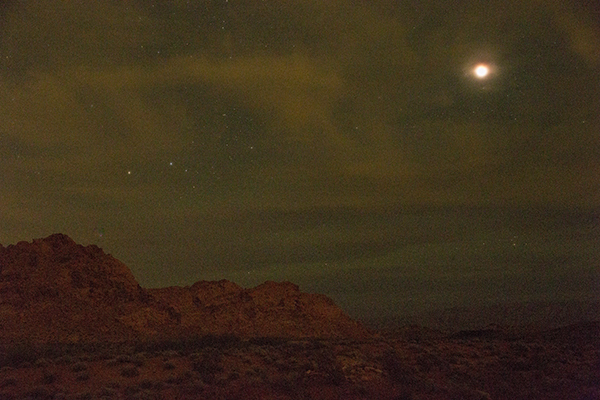 But back to the camping, night photography and making coffee. No.10 tin can – camp coffee, prospector’s coffee – throw grounds in water and boil. Let sit a few minutes for grounds to settle. If you have had Eastern European coffees, Expresso, you get the idea. Various cloth tea bag type filters – awkward and you hike with the wet bag to deal with ALL THE TIME. One cup at a time, coffee cold too often by time brewed. Or you are standing there wet filter in one hand, cup in the other and trying find some place to set the wet cloth bag, so you can get your plastic bag to put it in. Fresh grounds, a la nature. 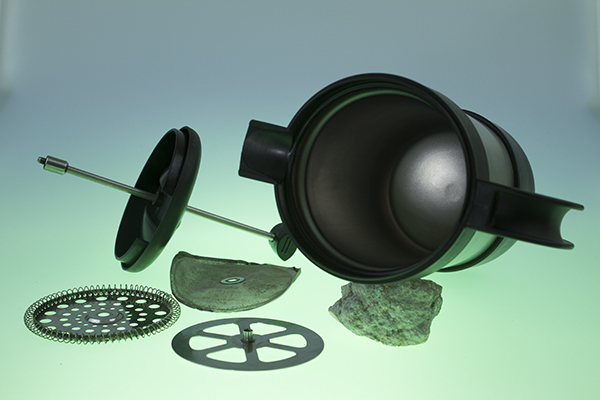 Plastic filter holder and filters like Melita – either too small, one cup at a time or too big to carry backpacking. Again often cold before you get to sit down and enjoy the coffee. A couple collapse-able out there, I don’t want to deal with one folding down on my hand. Worked in restaurants. Percolator coffee pots – OK, but I prefer the single pass flavor of drip. 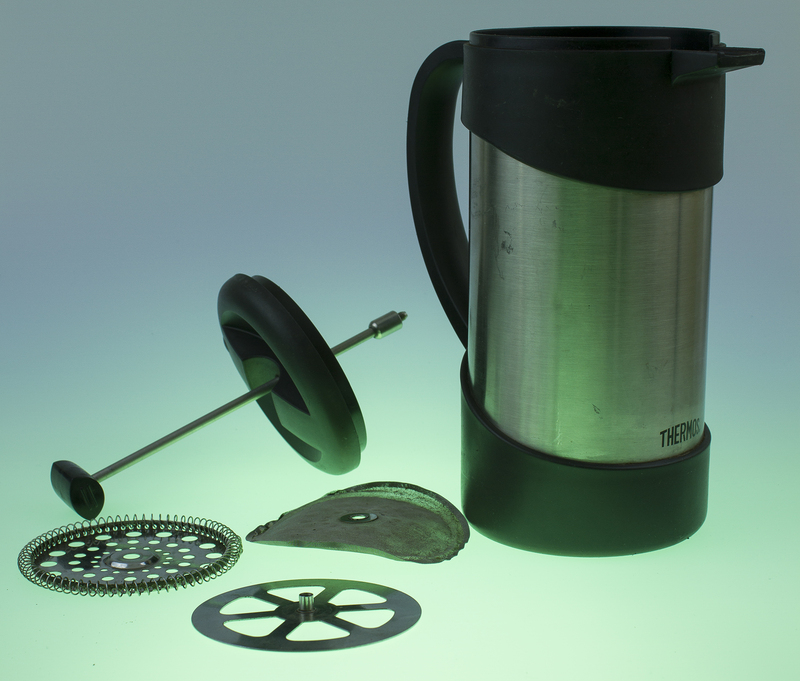 French Presses – my JetBoil cooking system has a little French Press kit. It does a ok job after a few uses, but means I can’t cook anything else with it’s one pot set. (extras are $50 ea.) Glass French Presses won’t last long around me for camping and backpacking, but Thermos made a Stainless Steel French Press. or, makes one cup of coffee at a time and is so slow the coffee is cold by the time it finishes brewing. Campmor.com has a Thermos Brand Stainless Steel French Press coffee pot. Which I had been looking at. I just knew it would NOT be light enough to carry backpacking. I got have room for camera gear!!!! Everything else is the support of my creative moments with the camera. 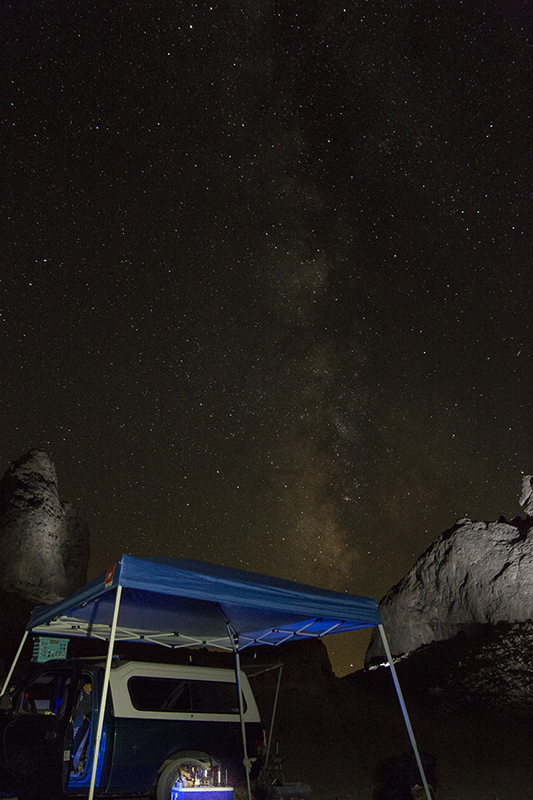 Clive and I do a lot of car camping, carrying lights and equipment for night light painting. So I figured OK, car camping we can have decent coffee if this thing works. 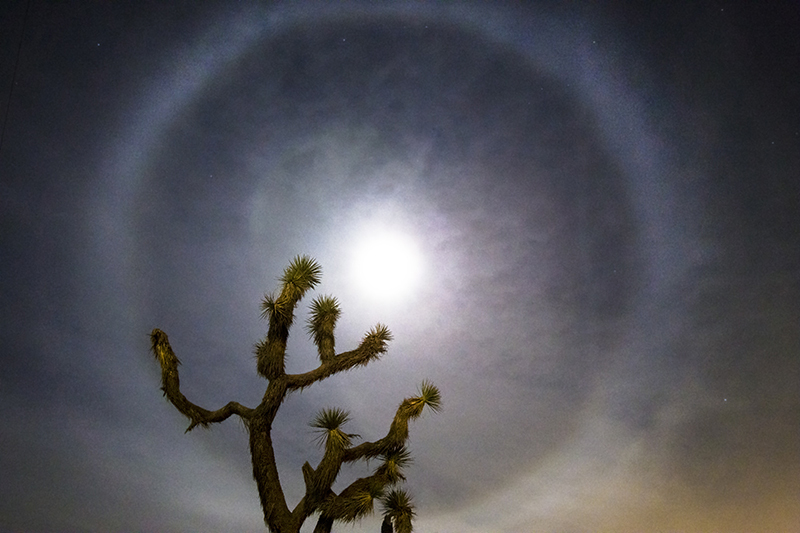 I have my Thermos brand Stainless Steel thermos and we can go out to shoot sunset for a few hours, come back and have some quick food, warm up some more coffee and go shoot the Milky Way or do light painting till 2 am. So yes, I know of Thermos from personal use. At 1.8 lbs, I figured it would never go backpacking, but as Clive will tell you. I will carry a lot of gear car camping so I have some options when the weather changes or we can’t get to the spot we wanted. What is another 2 lbs. As you can see the Thermos® Brand Stainless Steel French Press is very utilitarian, smooth rounded corners. Simple all metal design, standard french press. In the bottom side and interior shot you can see a little of the thickness of the walls of the double stainless steel chamber. The handle is a bit large and gets in the way during packing. However, a gloved hand will welcome the extra size. I work on my patience when packing. The press is a plastic lid and the button on the press rod. The rest is stainless steel. Solid course threads help you keep the screen snug. Yet easy to remove. The screen is heavy enough to withstand many pots of coffee and adjusting the screen after cleaning. It will remain in place and not get bent up easy, letting grounds passed. Mine is over a year old. Campmor.com site has the product info saying that Thermos French Press will keep coffee hot for 6 hrs. Well maybe it’s a new version, but my Thermos French Press does NOT have any kind of special seal on the top and is just a single layer of plastic. I would say an hour or 2 at best. BUT when everyone else does Not come close, not a problem. The matte black finish of the plastic handles the abuse very well, and does not become slippery when wet. The Stainless steel is 18/8 so you have good quality material. The 1 quart capacity is the same as my Thermos® Brand Stainless Steel Thermos, so it makes one thermos full at a time very nice. I can make a pot for us and then put on another pot for the thermos. My MSR tea pot is 1 quart also. K.I.S.S. That is why I changed to the MSR Whisperlite Universal. The burner collapses down small, but it is wide enough for a 7 or 8 inch pot. Standard backpacking mess kits. And it still has an inside stable area when some one wants to heat their food in a tin can. Uses the Isobutane/Propane fuel canisters, (special note in minute about the fitting!!!!) or white gas/unleaded gas, or kerosene. A few minutes changing fuel jets and connections, and ALMOST anywhere in the world, I can find fuel. SPECIAL NOTE: MSR is aware of the issue of the screw fitting for the Isobutane/propane cans stripping out. I carry a few extras, $5 or so each. I first thought is was the canisters, BE VERY CAREFUL ATTACHING THE CANISTERS. MSR will replace the piece, just send it to them and they will send a new one, call first for a RMA. Once it started I was still able to use the connector for a few more trips, (till I figured it out, duh!). With a 1qt tea pot, I put water on first, then we either both use my stove for our meals, it takes 5 or s0 minutes to boil a quart of water and meals are ready in minutes too. 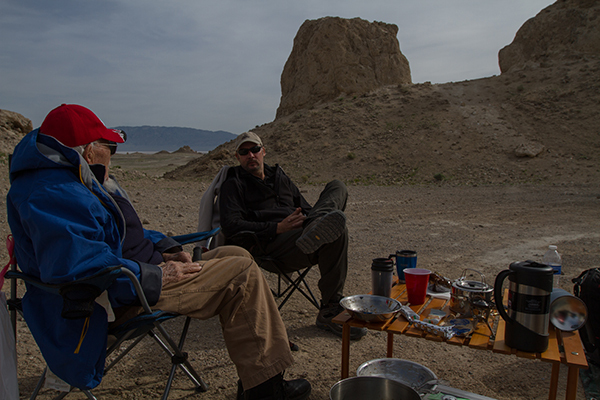 However, because we are running around getting gear together, coffee and food sit for a while. Our cups of coffee if made hot, sitting in camping cups, still cools off. Yes, I have a Thermos Brand Stainless Steel Travel cup too. I have had it keep my coffee hot for 8 hours sitting on my backpack in the night air. Note to Thermos and everyone else, there is no easy way to know where the drink holes are. I put a piece of gaffer’s tape on 1 side to note where the hole is. The tape is rough enough to feel in the dark and easy to see while driving. Saves a lot of coffee from going down the side of my face. The button also is very hard to know if the valve is open or shut. I freaking will hold the cup out and try to pour out, spilling hot coffee on one’s self is never fun. And the button is not trust-able. Be Aware! but we were so use to cold coffee……..
we came over for that first cup of coffee from the Thermos® Brand Stainless Steel French Press, poured our cups. That coffee was still hot and I knew it had been 20-30 minutes since I poured the water. I now heat the water to less than boiling on coffee for our cups and will boil it for the thermos. When I go go backpacking, all my gear is being re-decided, the Thermos Brand Stainless Steel French Press is Going!!!! Yes! I love Coffee! And will make some sacrifice….. I may put the press parts inside and hang the pot by the handle outside, but it is going backpacking. So now you know the old man’s secret to staying out there deep in the middle of nowhere with a Great cup of Peet’s Coffee. SPECIAL NOTE: This page is being created to go on the site of Nick Usbourne’s CoffeeDetective.com website, if I do it well enough. I am a student in his instructional Money Making Website program. 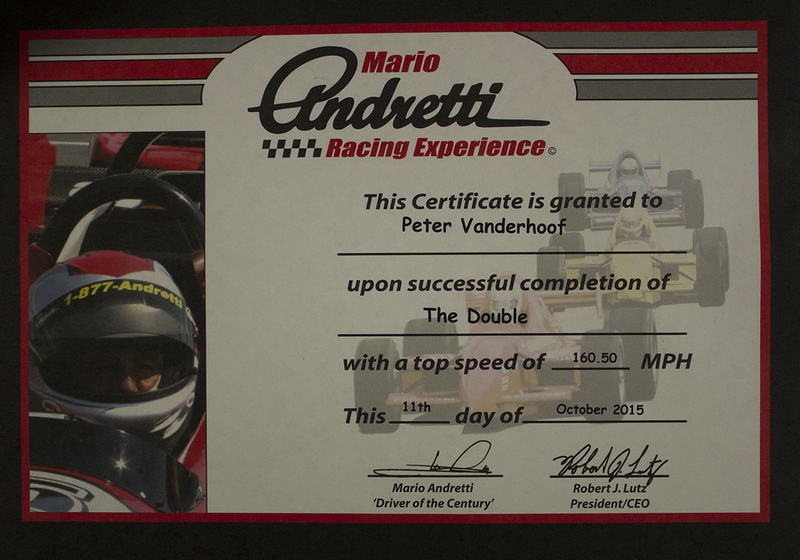 I kind of get to give the instructor and apple…..he doesn’t have a camping COFFEE section on his site yet. Ask some questions. I will be announcing some upcoming workshops including a very special by reservation only Ghost Town workshop. Nine months into a new business and I’m still setting up. I needed the fresh air, 9 days of on the road. Running in with a storm front or some kind of clouds most the way. Like a pinball I bounced this way and that through some 1,560 miles, 6 ghost towns, Mono Lake and eastern Sierras for a preview of the fall colors and a few wrong turns or just curious to see what is around the corner Finds of great enjoyment. An adventure is not an ADVENTURE to me if everything is planned out and NOTHING LEFT TO CHANCE! GOT TO HAVE MYSTERY. 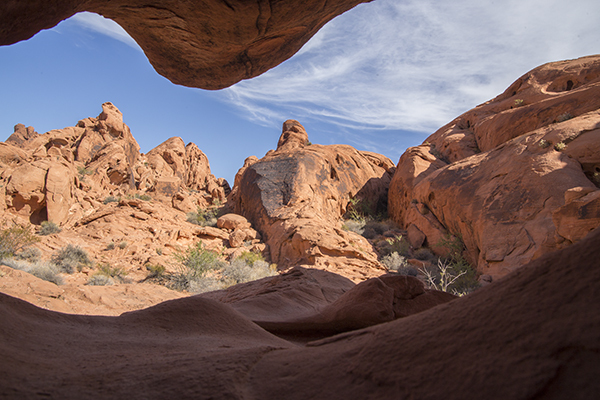 First stop was with an old pro photographer, Rick Rosen, he was showing us his favorites shooting spots in the Valley of Fire in Nevada. 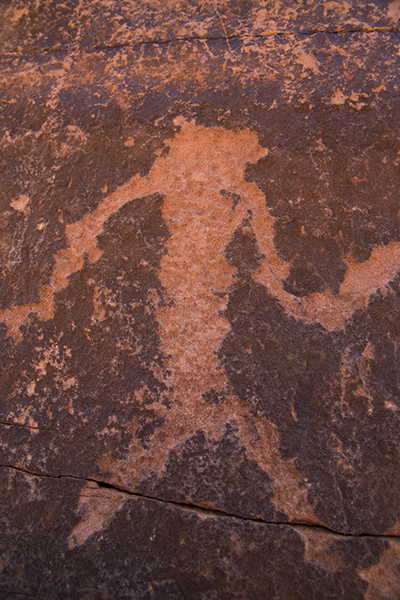 Got some great petroglyphs before the eclipse. I however have them in this post after the Eclipse. 33 years till this eclipse thing comes around again. Yes, the clouds were a pain, the group I was with found our spot to shoot and this is what I got…….jumped out shot this 200mm f/10 1/100sec ISO 2500, hand held! People were using the area for a wedding when we passed by about 15 minutes earlier. So we came back since nothing was further up the road. 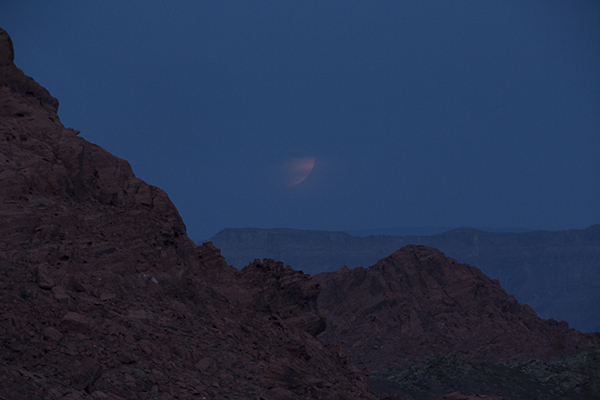 Grabbed my tripod, looked for a view and the moon was behind the clouds. A little later, peeking out again, Quick,Find it! Range it! Shoot! 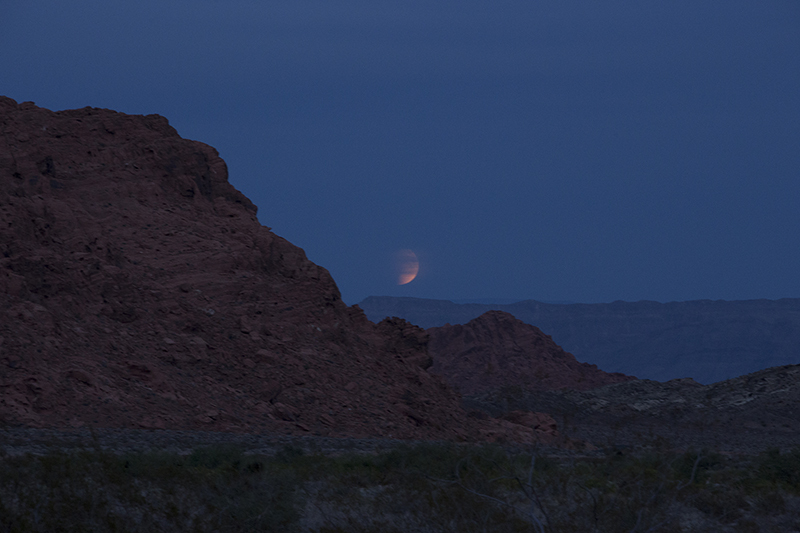 Clouds clearing again for a few minutes, yes it is almost a Blood Moon eclipse. 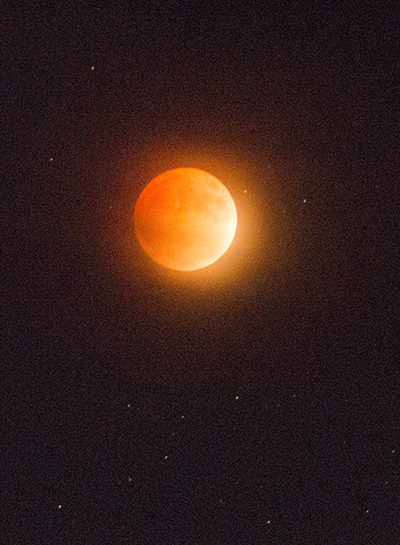 and Blood Moon photo of Course, happened with a little hazy clouds but there are a couple stars in this tighter crop of a ISO 16000, 294mm, f/6.3 @ 3.2 sec exposure. and for a Meetup.com shooting buddy I ran with few years ago, a Hole shot! 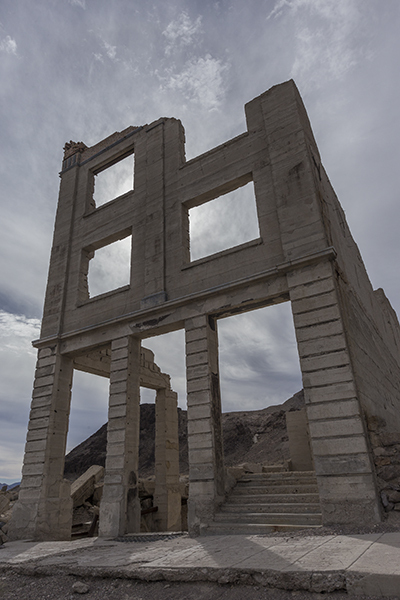 Next day I moved on to Rhyolite. Get there early. Get your shots before the crowds get there. Can’t get early, plan to stay till closing. 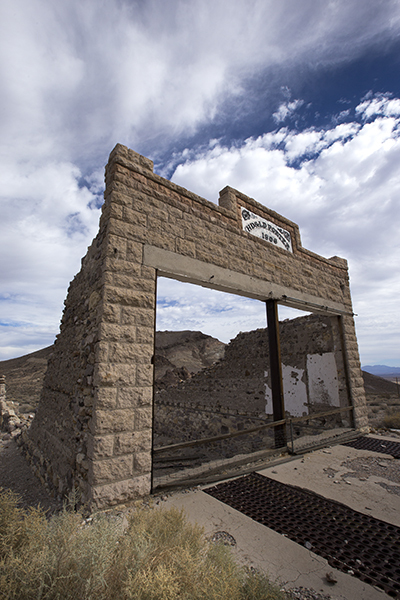 Most Ghost towns open sunrise to sunset or less. Most tourists will head for food and lodging mid afternoon. 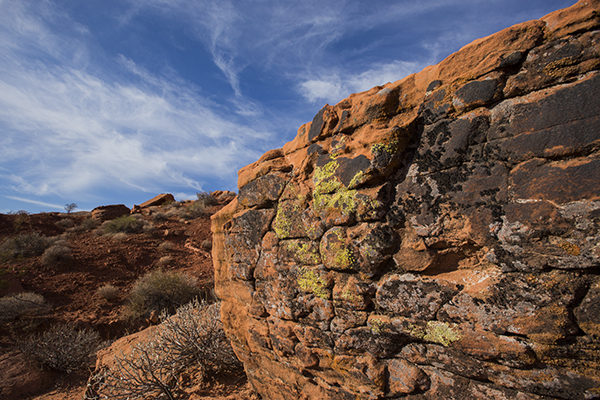 Less traffic in your shots, maybe some early golden hour shots. 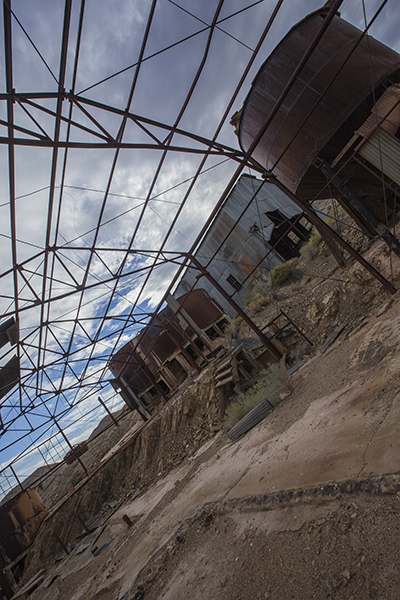 The ghost towns don’t want people walking around in the dark, too dangerous. The storm clouds were present for most of the trip, some times getting so thick and soft as to be a gray blur. I slept in the cab of my Ford Ranger. I didn’t want to wait for tent and stuff to dry out if it rained. Just curl up for a few hours. Then move on again. Next stop was Gold Point Nv. Nice out of the way place. But some fun stuff out back of the town too!! 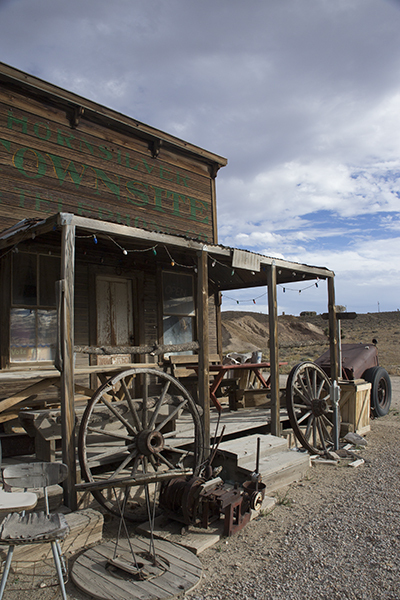 The next 2 stops were not much for me to shoot, Goldfield is a living town and too busy for me to stop that day. Belmont was marked private and very obvious homes in and around everything, just quietly moved on after a shot or 2. 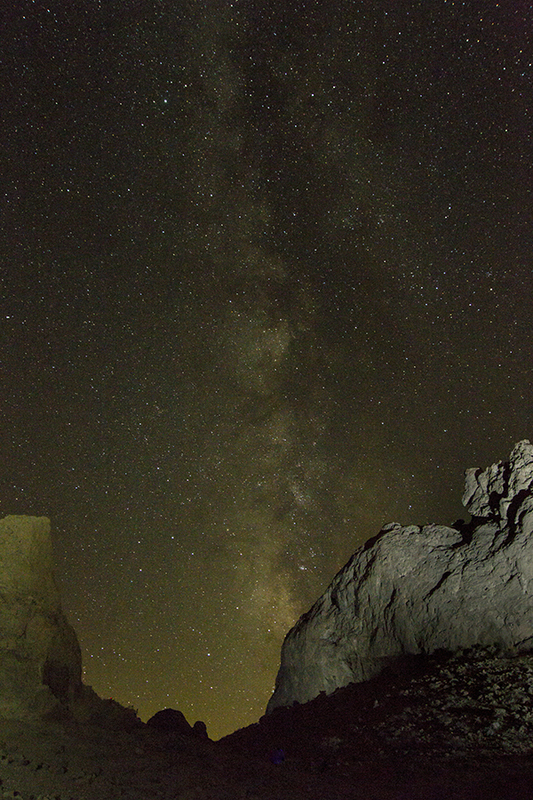 However there is a campground that may be very good for astrophotography, long ways to anything. Very tiny town. 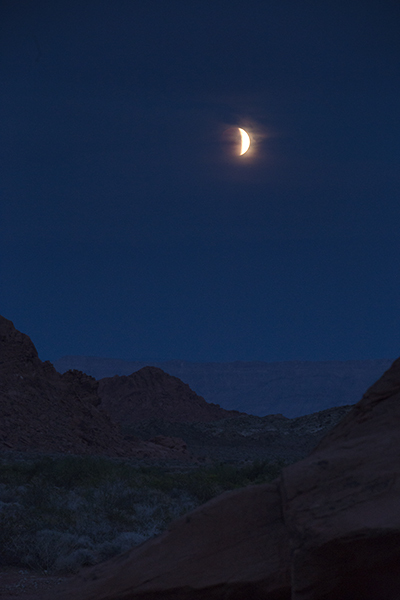 Will spend a night or 2 out there, to see. 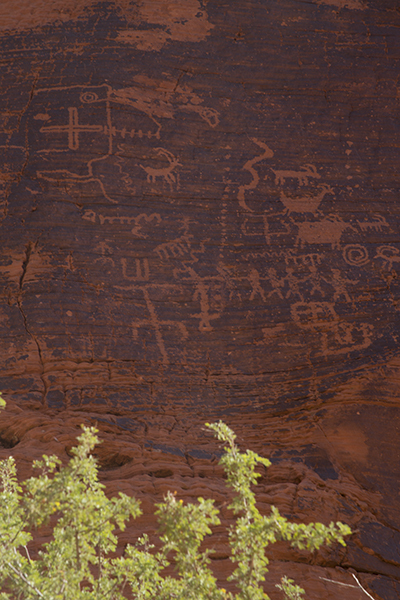 That was the turning point on US 95, I came back down to US 6 and went West. 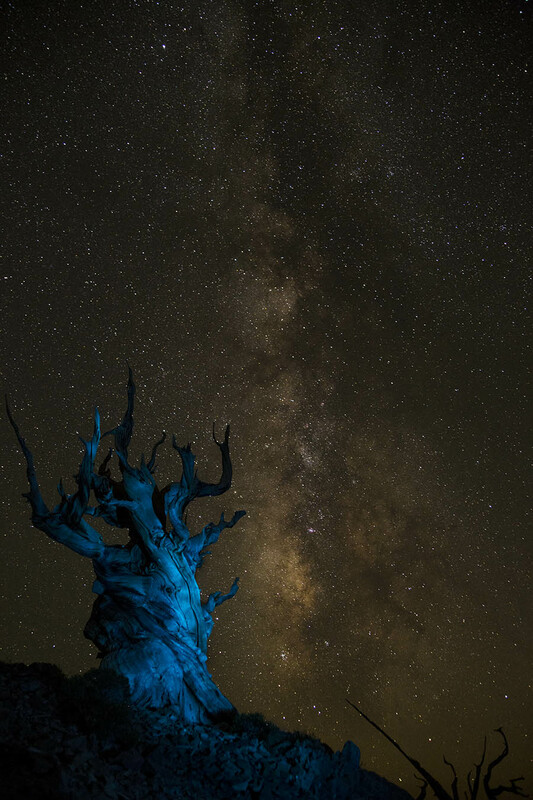 Mono lake and Eastern Sierra, Bodie!!! However it is break time, so this is Part one, and I will begin Part 2 after dinner. Creative shooting and please feel free to ask questions.